When this gun goes up, you guys are so dead. Note: this post does not mean I wholeheartedly condone Modern Warfare 2's linear narrative structure because I choose to work inside its confines. It's simply an interesting exercise to write within a predetermined framework, something game writers unfortunately have to do entirely too much. I recently reread Tom Francis' brilliant reimagining of BioShock's ending, and it got me thinking about my previous post which detailed my views on Modern Warfare 2's "No Russian" level. My main complaint was how the linear narrative of Modern Warfare 2 isn't suited for such a set piece, yet it was limited to just that: a complaint. Everybody can point out problems, but only a few go that extra mile and come up with a solution. So I aim to provide an answer to the narrative problem presented by the "No Russian" level. Read more about Rethinking "No Russian"
Ah yes, Call of Duty: Modern Warfare 2. What can I say that hasn't been said a thousand times before? Well, this. As in the script, the following post contains spoilers if you're one of the three people who hasn't yet played the game. 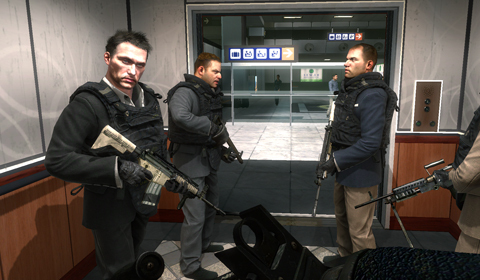 Anyone talking about Modern Warfare 2 can't help but mention the 'No Russian' level, where you play an undercover operative being forced to take part in the killings of innocent civilians. Going past what others have said, I'm interested in a player's response to this level when that player had no prior knowledge of it. I'd like to hear the reaction of someone who somehow missed all the pre-release footage of 'No Russian', had a wild ride on a snowmobile and suddenly found themselves witnessing and/or participating in a massacre. It's fair to say that the (intentionally?) leaked footage helped in softening everyone up to the idea, if not getting everyone interested on whatever point on the morality spectrum.